The Agreeable Gorilla: the power of "And"
“Yes it is. We absolutely can explain this to IT, but I don’t think it will help much. They’ve already planned out their infrastructure work for the next four quarters.” I don’t think Jack was getting just how hard what he wanted to do was. The number of hoops we (I’d) have to jump through was staggering. I gave a shrug, “Sure we can, but they won’t say yes.” Jake nodded but kept silent. “Okay, Saskatchewan is off the table, any other ideas?” I looked around the table hopefully but no one said anything. Sigh it was going to be a long meeting. Have you ever stopped to wonder at the power of this simple little conjunction? With three simple letters you can entirely negate everything that came before it and utterly replace it with what ever you say next. This one little word has the power to destroy communication. Are you a but-head? Grab a pen and a piece of paper. Go to your next meeting and listen to everything you say. Every time you say “but” make a hash mark. You may find yourself very surprised. Now have a friend do this exercise for you. Odds are, there will be even more hash marks. We are so ingrained in the use of the word that we don’t even hear ourselves saying it. I’ve been aware of the dangers of this word for years, and I still catch myself going to this word at least three times a day. It is simply amazing how much more open your communication becomes by substituting one three letter word for another. You take a conversation from a conflict, to a collaboration. From an either/or decision point to a “cake and eat it too” cooperation. “We were going to go to the movies, but we decided on going to dinner instead.” – This makes it sound like a bad thing. “We were going to go to the movies, and we decided on going to dinner instead.” – Was there conflict? We have the power to change communication. With a simple substitution we topple even the biggest gorilla in the room. A Month Passes Addendum: I’ve spent the last month paying attention to the use of “but” around me. I’m absolutely amazed at how common the word has become. 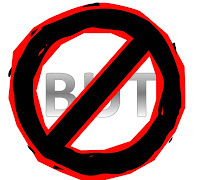 In one recent coaching session, my client used “but” two times in a “sentence,” creating a very conflict laden run-on sentence. I was editing some writing and found no less than three “buts” in one short paragraph. The writer had meant it to show how flexible something was, only the end result was to create a series of conflicts of what something could do. Reminded me of the old Ginsu steak knife commercials, “but wait there’s more!” Are you a steak knife or a can opener? Make up your mind! And I noticed another word, that is insidiously creeping up to supplant “but” while being no less controversial. When someone says “Actually, it’s white, not black” do you have the urge to smile and agree or reach out and smack the offending words from the person’s mouth? This entry was posted in Conflict Resolution, Management by Silverback. Bookmark the permalink.